Good Kindle News for Canada! Update on Reading Kindles in a Salt Room: Donâ€™t Do It! How to Publish Your Book for Kindle â€“ Guy Kawasaki to the Rescue! Microsoft Surface Review: How Well Does It Handle Kindle Content Compared with iPad and Kindle Fire HD 8.9â€³? Tech Tip - How to put content on your Kindle in the middle of Wyoming. Click here to see a map of Whispernet coverage. Kindle Quote - From Barack, Inc. by Barry Libert and Rick Faulk. Interview - Joshua Tallent of Kindle Formatting talks about how to format books for the Kindle, Digital Rights Management, and other e-topics. Josh will be teaching a session in February at the O'Reilly Tools of Change for Publishing conference. An example of his formatting work is Lost Sonnets of Cyrano de Bergerac. The Medialoper's encounter with Jeff Bezos is described here. Quote - from Tree of Smoke by Denis Johnson. Comments - Dan Meyer, John B, and Linda Hopkins. 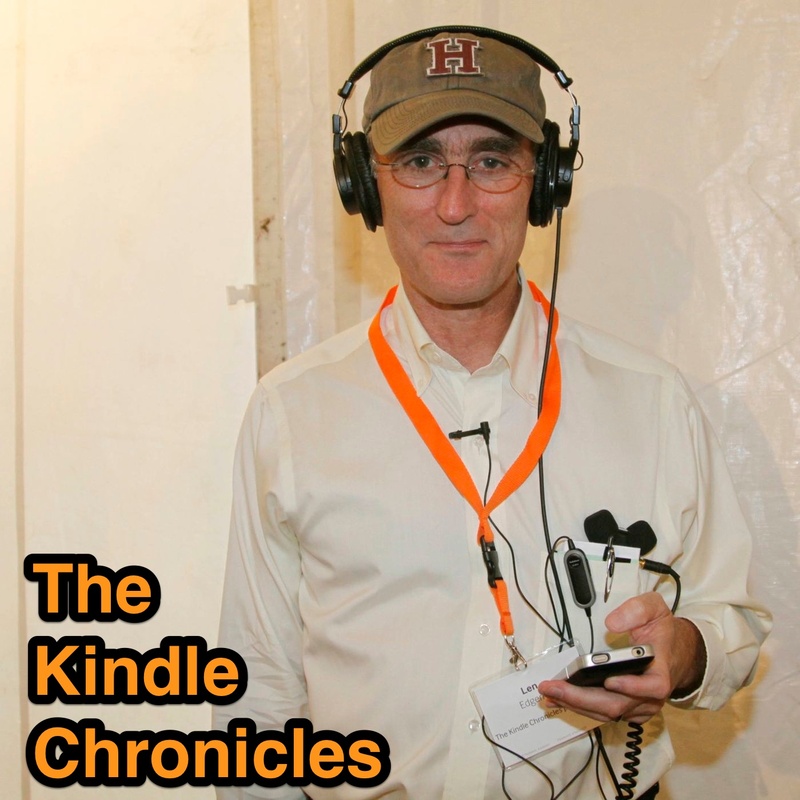 If you'd like to be on the Kindle Chronicles Email Alert List, please drop me an email at PodChronicles@gmail.com . You'll be the first to know when new episodes of the podcast are posted. Next week's interview, via Skype: Starbuck, the online name of an Army Captain on active duty in Iraq who always has his Kindle with him, the better to have something to read when unexpected wait times occur. Interview - Will DeLamater, creater of the EduKindle blog, has evidence that the Kindle is making inroads in schools. Plus interesting educational developments for the Kindle in Utah and at the Harvard Medical School. Quote - The beginning of The Dip by Seth Godin. How to be a successful quitter. Comments - Karen, Linda Hopkins, and Dan. Upcoming interviews: Steve Shaw, creator of the Kindlelicious blog; Joshua Tallent of Kindle Formatting, and Capt. Crispin J. Burke, who is Kindling while on assignment in Iraq. Interview - Sriram K. Peruvemba, Vice President of Marketing at E Ink Corporation, interviewed at the company's headquarters in Cambridge, Mass. The audio podcast contains excerpts of our conversation, and this video has the full interview. Quote - "Senior Moment" by Dana Milbank of The Washington Post. Comments - Audio from Peggy, text from Julie Booth. 6. You will be asked to enter your email address, so do that and then click on the green â€œDownload Applicationâ€ button. 8. From here, what you see will depend on whether you are using a PC or Mac, but the essentials are the same as with any other download from the Internet that you do on your computer. For the Mac, I see a dialog box saying, â€œYou have chosen to open classicstrial103.zipâ€ which is a zipped file containing numerous separate items. I click on â€œOKâ€ to open it with Stuffit Expander. However your computer works, your goal is to be able to find a folder on your hard drive titled â€œClassicsTrialâ€. Mine shows up in a Downloads folder. 12. Drag the â€œClassicsTrialâ€ folder into the â€œDocumentsâ€ folder of your Kindle. I just tried this on my MacBook Air, and it worked fine â€“ I assume the same process will work on a PC, but if you run into trouble you might try selecting all the individual books in the â€œClassicsTrialâ€ folder and dragging them in one big bunch into the â€œDocumentsâ€ folder. 13. Once you have the â€œClassicsTrialâ€ contents in the Documents folder of your Kindle, safely eject the Kindle icon and then unplug the USB cable. 14. Checking on your Home screen, youâ€™ll now see about three added pages of demo versions of classic books. 15. Iâ€™m pretty sure that once you sample some of the demo books, youâ€™ll want to spend the $19.99 to purchase the actual collection. Iâ€™m going to do that now but make sure they go to my SD card, to keep my main Kindle. 16. The purchase process via Handango is routine, and you donâ€™t have to wait for a registration code. The folder is called â€œClassicsFullâ€ . Itâ€™s about 115 megabytes in size, so even with my speedy Comcast connection (31 megabits per second when I was doing the download last weekend) â€“ it took a while for it all to load to my computer, and then another few minutes for it to load from the computer to the Kindle. 17. Iâ€™ve got a 1 GigaByte SD card in my Kindle. After adding 2,000 classics Iâ€™ve got 838 MB left, or room for another 16,000 classics on a storage device that cost me less than $20. 18. One thing I donâ€™t like is that all these new titles appear in my Home pages on the Kindle, even though I put them on the SD card. At least they are gathered by author, so you click on an author to see all the titles he or she wrote. 19. All in all this is a great resource, and I want to thank Nick for suggesting that I follow the process for this weekâ€™s Tech Tip. Interview: My wife's opinion of her Kindle improves during her first month of use, despite her biggest fear coming true. NOTE: If you know some great sources for contemporary mystery writers for the Kindle, please let me know, so I can pass them along to Darlene. Quote: from a book about Afghanistan being read this week by the President-Elect, Ghost Wars by Steve Coll. Comments: Do you read YOUR Kindle during takeoff and landing? And, good news on book sales from David Emberson. Please feel free to leave me a voice comment by calling 206-666-2713 or a text comment at PodChronicles@gmail.com or as a comment here on the show notes page. Music for my podcast is â€œRa-Monkâ€ by Eval Manigat on the â€œVariations in Time: A Jazz Perspectiveâ€ CD by Public Transit Recording, courtesy of IODA Promonet. Tech Tip: From The Kindle Cookbook by David Emberson, how to put the MobileRead guide on your Kindle for free book downloads. (Other good Kindle guides mentioned: Decoding the Kindle by Jim Cheshire and Complete User's Guide to the Amazing Amazon Kindle by Stephen Windwalker. Interview: Evan Schnittman, vice president of business development at Oxford University Press, speculates on why November 19, 2008 may be another big day in the history of the Kindle. Kindle Quote: Don Juan by Lord Byron, in French. I'd love to hear your comments. You can leave a voice message at 206-666-2713 or email me at PodChronicles@gmail.com . Interview: Laurel Hicks, a moderator of Kindle Korner. On her Kindle: War and Peace by Tolstoy, Works of Anton Pavlovich Chekhov from MobileReference and the blogs Opinionated and An Unamplified Voice, an opera blog. Kindle Quote: Mmm-good: Campbell Soup fares pretty well in the financial debacle. An article in Investor's Business Daily. Comments: Linda Hopkins, Jimmy Buffet video, and a good correction from Greg. Kindle Quote: from Spirit House, a Vincent Calvino Novel by Christopher G. Moore. Kindle Comments: audio from Bryan Person, comments on the show notes page from Greg Pyles and Paul. Interview: Andy Ihnatko, technology columnist for the Chicago Sun-Times. Kindle Quote: from McCain's Promise: Aboard the Straight Talk Express with John McCain and a Whole Bunch of Actual Reporters, Thinking about Hope by the late David Foster Wallace and Jacob Weisberg. Kindle Comments: Rusty from the show notes page and an audio comment from Paul Higginbotham. Tech Tip: How to highlight a section of text which begins on one screen and ends on the next. Also, Jan Zlendich's tip for helping your Kindle make it home if you leave it somewhere. Kindle Quote: Human Smoke by Nicholson Baker. Kindle Comments: Al, and Bryce Craig of Santa Barbara, California. LATE-BREAKING REPORT WHICH DIDN'T MAKE THE PODCAST: Via Jim Cheshire, I see the New York Times today is quoting Craig Berman, Amazonâ€™s chief spokesman, as saying, "One thing I can tell you for sure is that there will be NO new version of the Kindle this year. A new version is possible sometime next year at the earliest.â€ I hope that's just smoke. This is the .mp3 version of this week's episode featuring a "What's on Your Kindle?" interview with author Stephen Windwalker. Electronic newspaper readers in Germany and France, as well Dave Lester's Treeless Systems project in Denver that I profiled in a podcast two years ago. A rosy view of the Kindle's future sales and one not so rosy. One thing NOT to do with your Kindle. A Free Webinar, "Leveraging the Kindle - How to maximize the Kindle's benefits to your readers and your business," by Joe Wikert set for August 21, 2008 at 11 a.m. ET. Joe is author of the Kindleville blog. How to use FeedBooks to load RSS news feeds onto your Kindle for free. The "What's on Your Kindle Interview?" - Stephen Windwalker, author of the current Number 10 Kindle seller, How to Use the Amazon Kindle for Email & Over 100 Pages of Other Cool Tips (The Complete User's Guide to the Amazing Amazon Kindle. I taped the interview after lunch on August 6, 2008, at Casablanca in Harvard Square, Cambridge. Steve describes his experience writing for the Kindle and tells what changes he hopes to see in the next version. Kindle Quote: Suite Francaise by Irene Nemirovsky. Phone comment line: 206-666-2713. Please call and leave a comment, suggest someone for a "What's on Your Kindle Interview?" or offer ideas to improve this podcast. I look forward to hearing from you! mp3 version of Episode 2 featuring "What's On Your Kindle" interview with C.C. Chapman. The "What's on Your Kindle?" Interview: A telephone conversation with C.C. Chapman, who runs a digital marketing company called The Advance Guard and is host of the Accident Hash, Managing the Gray and U-Turn Cafe podcasts. His informative comments include how he uses the Kindle to inspire him onward in writing a current manuscript. What's on C.C's Kindle: subscriptions to The Boston Globe and Newsweek and Time magazines, Child 44 by Tom Rob Smith, personal .pdf documents, two books he can't talk about, and a manuscript he's working on. Kindle News: Spirit House, a Christopher G. Moore novel being offered for free on the Kindle through Aug. 28th, Josh Quittner's glowing Kindle review in Time, the Kindle Social Network, and my fruitless hunt for independent confirmation of the CrunchGear rumor of a new Kindle coming in October. Tech Tips: a hardware fix at 30K feet, keyboard shortcuts, and how to change the text justification. Kindle Quote: inspiring words from The Autobiography of Andrew Carnegie. Kindle Comments: SCG, Baratunde Thurston, and Kesler Woodward. I'd REALLY like to include your feedback in this podcast, so please don't be shy: leave a comment at 206-666-2713 or email an audio file or text message to me at PodChronicles@gmail.com, or leave a comment here. The Kindle Chronicles is now listed for free subscription at the iTunes Store. Please leave a comment! Len Edgerly, a graduate of Harvard College (1972) and the Harvard Business School (1977) has worked as a business journalist at The Providence (R.I.) Journal-Bulletin, editor of an energy magazine in Casper, Wyoming, and an executive at a natural gas company based in Denver. After early retirement, he earned a Masters in Fine Arts in poetry from Bennington College and has served on arts policy boards, including the Western States Arts Federation, the Denver Commission on Cultural Affairs, and the New England Foundation for the Arts.